In his early childhood at his hometown Jodhpur in Rajasthan, Manish picked up this unique instrument – the slide guitar – quite naturally after watching his father play popular melodies on it. Later his serious nurturing in Indian classical music started with maestros like Pt. Basant Kabra, an eminent sarod player, and Pt. 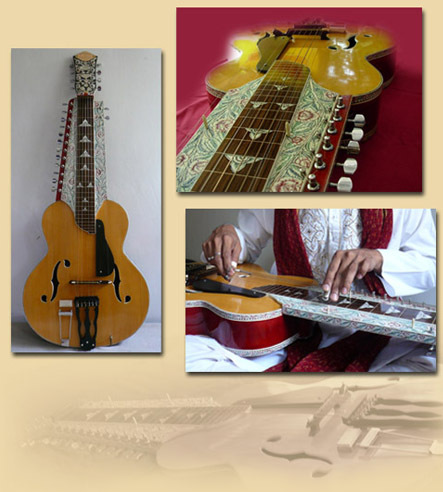 Brijbhushan Kabra, hailed as the ‘father’ of Indian slide guitar. During this time he also made a documentary film called The Guitar Odyssey for Indian television, depicting the story of how Pt. Kabra came to adapt the guitar for Indian music. After Pt. Kabra’s innovative intsroduction of this instrument to the world of Indian classical music, it was left to Pt. Vishwamohan Bhatt to successfully take it to audiences worldwide. He aptly calls his model of slide guitar mohanveena, as its hypnotic sound would never fail to mesmerize its listeners. Another maestro who has taken this instrument to heights of melodic exuberance and technical dexterity is Pt. Debashish Bhattacharya. Hailed by the world press as the ‘fastest slide guitarist alive’, he has designed and developed three models of Indian slide guitar – chaturangui, gandharvi and anandi. Manish presently plays the model Chaturangui but with some changes in its string arrangement and using his own playing technique.